The Edgars clothes catalogue offers the most gorgeous fashion at some of the best prices in South Africa. Edgars is a full service shop in that it offers ladies clothing, menswear, underwear and more to its customers. They not only cater to the masses by offering affordable clothing that is in keeping with the current trends for the season. But also sell international labels for those who are looking for something more elite. This means that Edgars is a shop for everyone and has the quality that everyone deserves. They additionally have a large number of specials running monthly. Which makes the decision to shop there so much easier. Should you not be able to get in to an Edgars store near you. Then why not take a look through the Edgars clothes catalogue. Alternatively, you can look through the Edgars clothes catalogue online as well as purchase online. As the chain stores are keeping up with the times and going digital. Edgars also offers a wide variety of affordable clothing for babies and toddlers. As we all know that children grow so fast that buying them something ridiculously expensive is just silly. There is also a large underwear section which offers the majority of international and South African brands. Edgars is also the only shop to import the Elle McPherson range of undergarments. Which are beautifully made and reasonably priced. 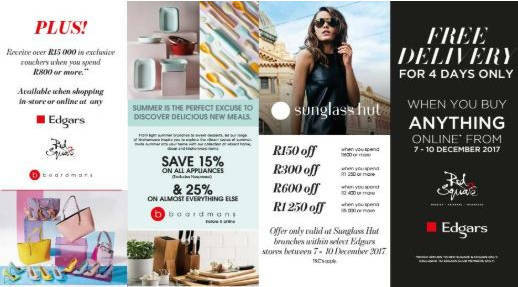 So for a shop that has something for everyone without compromising on quality or style, why not visit an Edgars today. This store stocks the leading fashion brands as well as their own store brands. There is a wide selection of menswear, ladies clothing, and beautiful underwear on sale. They also have specials on their products monthly whether it be clothing for babies or toddlers or shoes. When it comes to baby clothing at Edgars Stores, you could find yourself losing hours shopping for the little one/s. The thing is, you want the best for your children and when shopping at Edgars, this is what you will find. They have a wide selection of girls clothes and boyswear, and you will find any type of clothing item for any season. At the end of the day, we always find that our little ones have more clothes than we do. Especially when it comes to shoes. However, the truth is that these clothes and shoes will soon get too small and they have to be replaced. When shopping for any type of baby clothing at Edgars stores, many will tell you to buy Tshirts, shorts, skirts, pyjamas and jerseys a size bigger. So this way, your little one will still have to grow into it, making it last longer. Girls clothes can be something of a task, because you want the little angel to be warm and pretty at the same time. When it comes to boyswear, choosing one of the dozens of jerseys and some Tshirts will be enough. Don’t forget the pants, though. There is so much you can choose from when it comes to shopping for the kids. You should definitely have a look at the cute pyjamas and jerseys for those cold months. Babies are not fussy when it comes to clothes. They cannot tell you that they do not want this or that, but sometimes we as parents will speak for them. When the summer months approach, pack the Growers away and bring out the shorts for the boys and the skirts for the girls. Take a moment to see what baby clothing at Edgars stores you are able to find and get the best for your little ones.